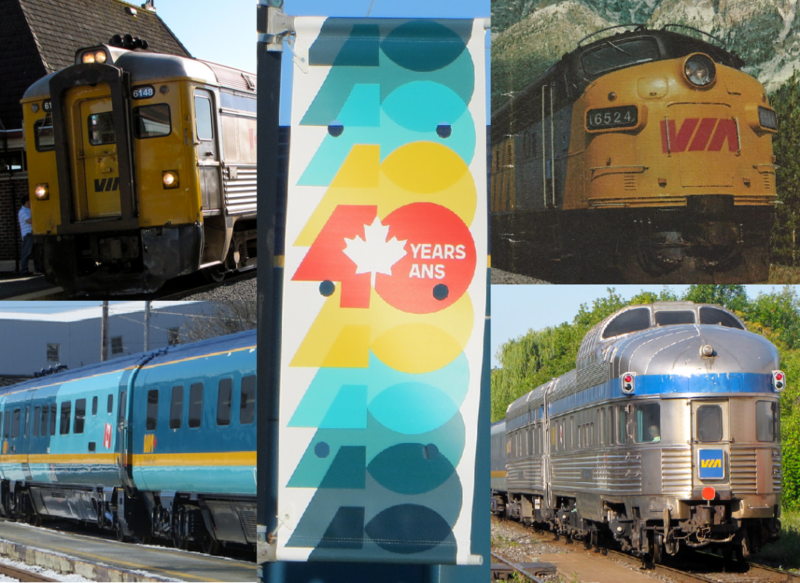 In 2018 Canada’s national passenger rail service is marking the 40th anniversary of its creation. Some critics will ask if there’s really anything to celebrate after decades of retrenchment and cutbacks, but optimists think there just might be a headlight at the end of the tunnel. On April 1, 1978, a Government of Canada order in council created a new Crown corporation. 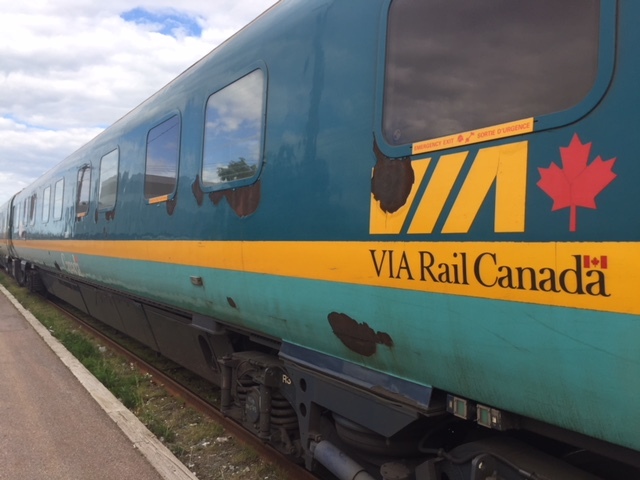 VIA Rail Canada had been established as a subsidiary of Canadian National Railways (then also publicly-owned) the previous year, but now attained new status as a parent corporation under the Financial Administration Act. 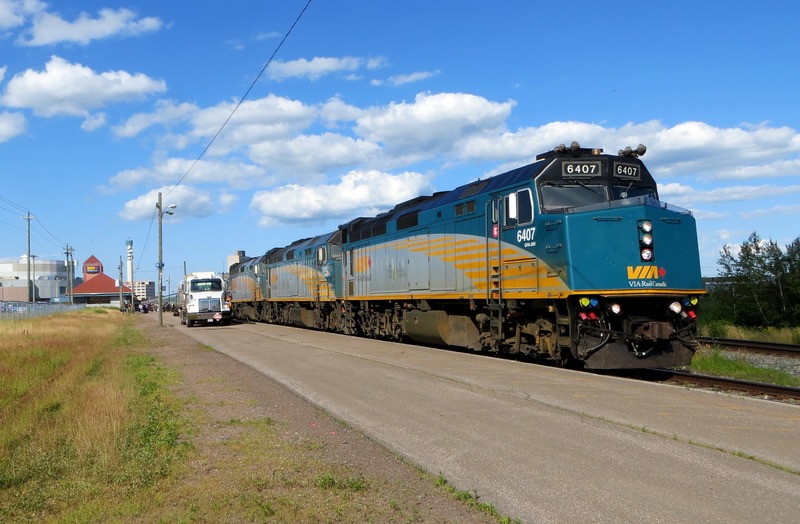 It was the next step in a government initiative to control the cost of supporting passenger rail across Canada, with a primary objective of addressing duplication of services. The intent was for the new corporation to assume full responsibility for the passenger trains operated at that time by CN and CP Rail. It turned out to be a phased-in process, with the first step being consolidation of marketing. Eventually VIA absorbed other managerial responsibilities, first from CN and later from CP. The new corporation took ownership of passenger rolling stock as well, including locomotives, and train crews eventually became VIA employees. This year, VIA is holding a celebration to mark the anniversary. And there actually is a little bit of positive icing to decorate the birthday cake – the first in a long time. This year’s federal budget included a major commitment to replace the entire VIA fleet in the Quebec City-Windsor Corridor, with particular emphasis on the Toronto-Montreal-Ottawa triangle. It’s the first significant investment by any government in new passenger rail equipment since the earliest days of the corporation’s history. For the most part, it’s been a long, sad tale of neglect and retrenchment. While we don’t mean to rain on VIA’s birthday parade, it is significant to note just how much passenger rail in Canada has deteriorated over the past four decades. This country’s struggling network now ranks dead last among the G7 nations – even well behind the United States, which hasn’t exactly done a stellar job in keeping up with the rest of the industrialized world either. The System Timetable in effect at VIA’s inception on April 1, 1978, was a far more robust document than what remains today. Four decades later, Canada’s rail passenger network is but a shadow of its former self, with the long distance services being particularly decimated. In its first year, the new corporation rationalized the transcontinental services, an initiative that appeared to have effected some significant economies with little detrimental effect on service. Passenger train ridership grew from just under five million in 1977 to peak at nearly eight million in 1981. But then came the first of an ongoing series of budget cuts by successive governments – both Liberal and Conservative. The most dramatic service reductions came in January 1990 under the Mulroney Tories, and the annual passenger count plunged to less than four million. Forty years on, some fundamental flaws remain in VIA’s very existence. There still has been no act of Parliament to give the corporation an explicit mandate or legal framework outlining its governance powers and responsibilities, assure it of stable and predictable annual government funding, or allow it any statutory negotiating power with the freight railways over whose tracks most of its trains must travel. Several governments have made promises, some have even made the first moves toward a VIA Rail Canada Act, and there have been also a number of private member initiatives – but all have either died on the order paper or been defeated by a partisan government majority. It would be blatantly unfair to blame the decline of passenger rail in Canada entirely on the management of VIA Rail. Some CEOs were political appointees, not particularly well-suited to the challenge, while others left a more positive legacy than most. But for nearly all of its existence, VIA has been treated like an unwanted child by successive governments. Transport ministers over the past 40 years – with a few notable exceptions – have paid scant attention to passenger rail. The physical plant and rolling stock have deteriorated, frequencies have been reduced, and schedules have slowed. On April 1, 1978, the fastest train between Canada’s two largest cities covered the 335-mile route in 4½ hours, with several others requiring only slightly longer. Today most Toronto-Montreal runs are scheduled for more than five hours, and delays due to freight congestion are endemic. 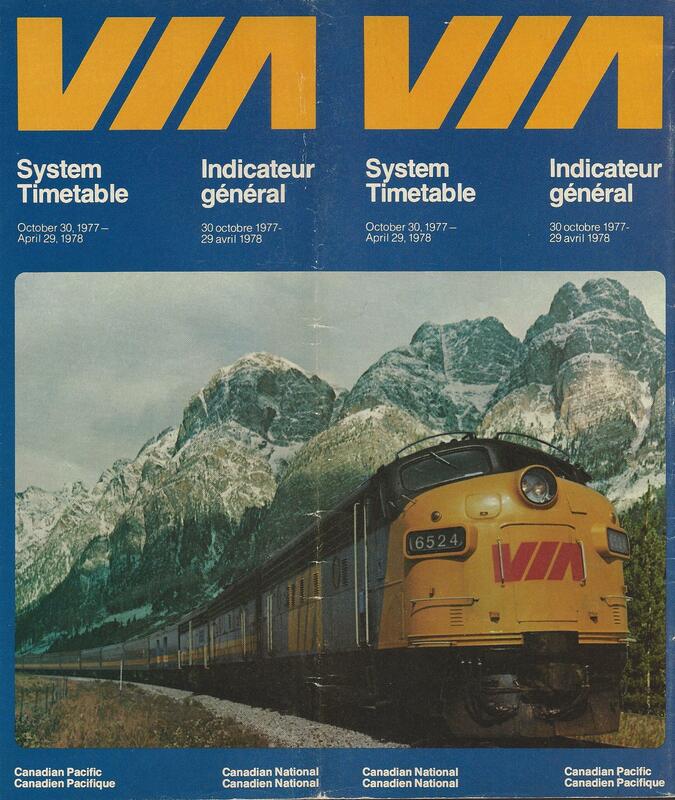 At VIA’s inception there were two daily transcontinental trains running daily year-round on two different routes between Montreal/Toronto and Vancouver. Over time that’s been reduced to a single tri-weekly train in peak season. For more than half the year it only runs twice a week – and its on-time performance is a national embarrassment. Major population centres like Calgary, Regina, Thunder Bay and Sudbury are no longer served. 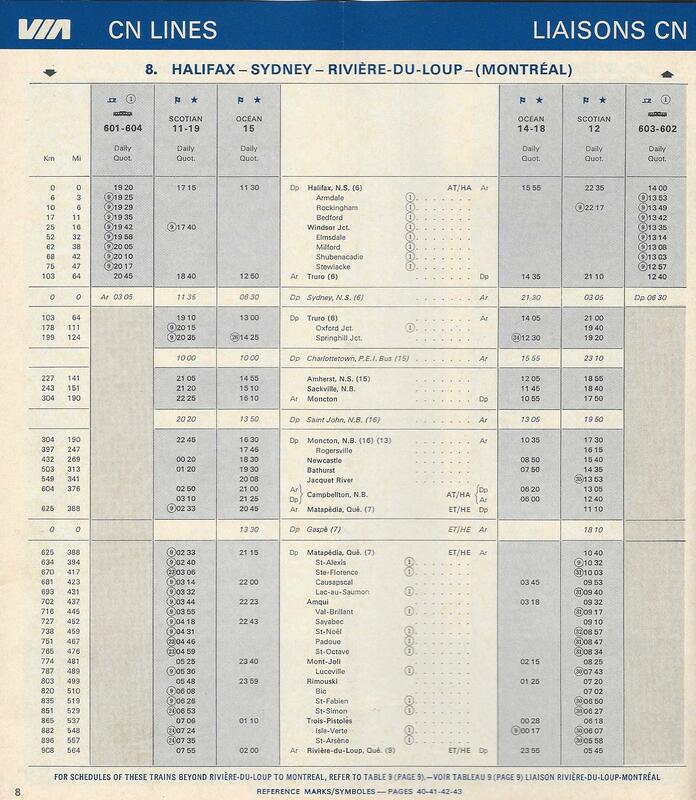 This page from the 1977-78 VIA timetable shows two full-service trains daily between Halifax and Montreal, and twice-daily service to and from Sydney. Closer to home, the 1977-78 timetable showed two full-service trains daily between Halifax and Montreal, plus a third overnight Saint John-Montreal run. 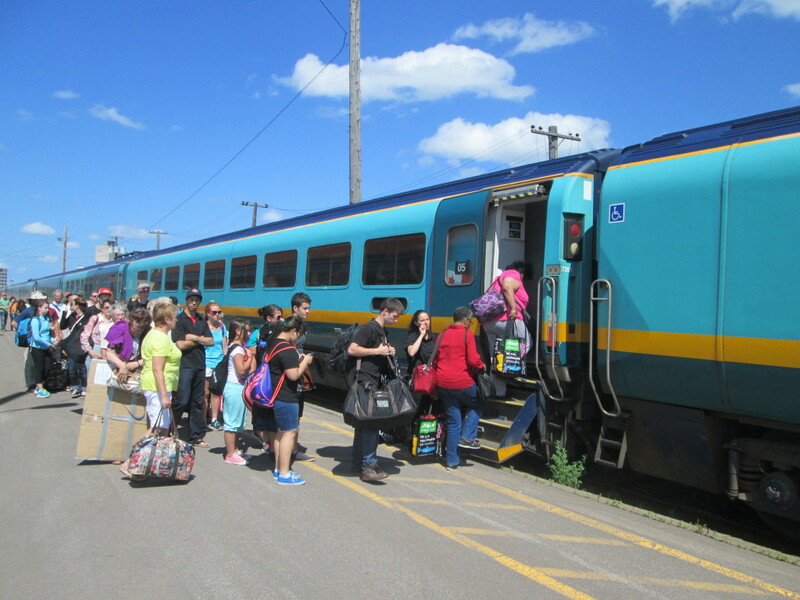 Local services ran twice daily between Sydney and Halifax, and Moncton and Saint John, and there were also daily Halifax-Yarmouth and Moncton-Edmundston RDC routes. Today we have only a sorry remnant – the tri-weekly Ocean on a considerably slower schedule mostly due to deteriorated track. Even VIA management acknowledges that it isn’t meeting local needs. The state of affairs in 2018 is really little cause for celebration, but there is renewed hope for better times ahead. The current government appears to recognize that passenger rail has been badly neglected, and is evidently prepared to make some much-needed investment – at least in the corridor. But whether they are willing to extend that vision coast-to-coast in a nationwide rebuilding of the “national dream” remains to be seen. The present management team at VIA is growth-oriented – in the corridor, at least – with a clear focus on customer service. The CEO would obviously like to be remembered as the guy who rescued passenger rail in Canada from the brink of oblivion. There’s no question he’s leaving his mark on the corporation, and he actually appears to enjoy interacting with fellow passengers on board the trains – which he rides regularly. It remains to be seen whether his vision of a dedicated passenger line between Ottawa and Toronto, bypassing CN’s freight-congested Kingston Subdivision, has legs. The Trudeau government remains non-committal on that question, but has earmarked money to further study the costly proposal, which would use a long-abandoned CP right-of-way through sparsely-populated territory between Smiths Falls and Peterborough. So, yes, let’s celebrate 40 years of VIA – but do not forget what has disappeared over that time. Some of what’s been lost we know will never return – but we must continue to advocate, to encourage, and to criticize those in authority whenever the occasion or the opportunity warrants. The endangered state of passenger rail – after all – is the key reason our predecessor organization Transport 2000 was founded back in the 1970s. And while the pendulum is swinging in a positive direction at the moment, we must not relax our vigilance in the warm glow of 40 birthday candles. The Spring-Summer 2018 issue of The Bulletin, Transport Action Atlantic’s twice annual publication, is now available online. 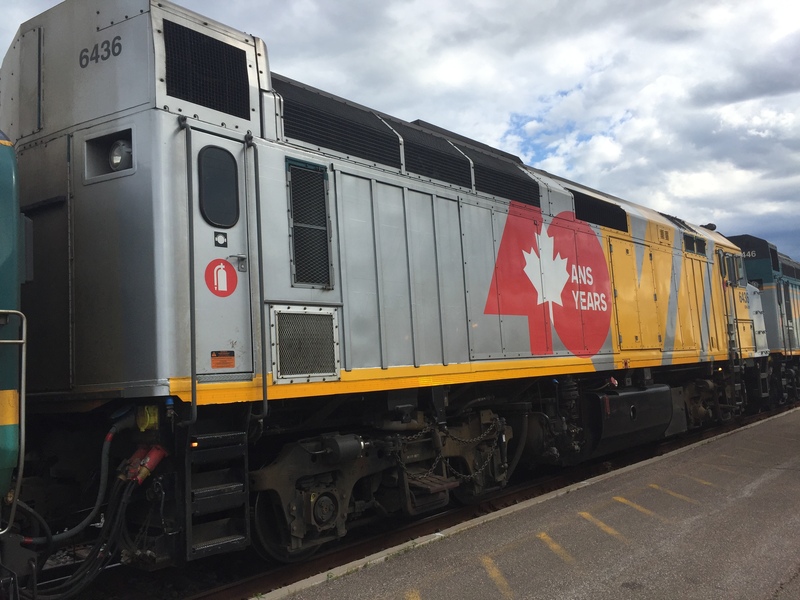 This issue’s feature coverage is VIA Rail’s 40th anniversary, a look at where the national passenger railway has ended up after four decades of service, and what the future might have in store. This issue also features additional rail news and commentary, updates on TAA’s advocacy work, marine and air news, transit and intercity bus updates, and much more!